At a $200 price tag, this baby dino can do tricks, act scared, happy, or sad, and sense light sound and movement. I hope the theme song on video below becomes an internet sensation. 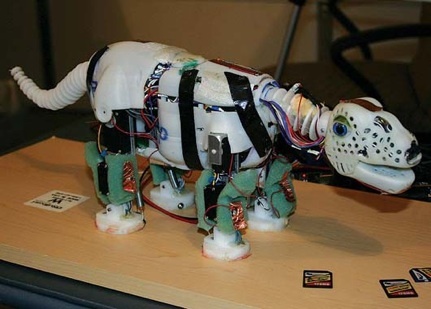 It’s hilarious: They plant the little pleo-bot in the arms of unsuspecting cute fiends who pet and cuddle with this computer machine. I’m worried that dinosaurs will lose their fearsome characteristics, and we’ll begin to become comfortable with them. Then when we begin to clone them we’ll expect them to be friendly. Certainly we’ll be destroyed, no matter how hard we try to cuddle.